In southern Costa Rica, the tranquil blue waters of the Golfo Dulce stretch between the Piedras Blancas National Park and the Osa Peninsula. It is an area of pristine tropical wilderness and abundant wildlife. The Gulf's calm jade green-blue surface makes it easy to see dolphins frolicking, sea turtles swimming, fish jumping out of the water, and marine birds diving for those fish. Starting in August, the Gulf gets even busier with visiting migrating Humpback Whales. 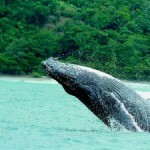 Known as a tropical fjord, the "inner sea" of Golfo Dulce is a critical habitat for Humpback Whales and is vital to the species' survival, according to the Center of Cetacean Investigation of Costa Rica (CEIC). Whales arrive annually to breed and give birth in the warm waters of Costa Rica's South Pacific Coast, from the Ballena National Marine Park just south of Dominical down to the Golfo Dulce. The annual migration of Pacific Humpback Whales is one of the most remarkable journeys by any creature on the planet. The marine mammals travel between 3,000 and 5,000 miles each way, from both the Northern and Southern Hemispheres, making them one of the farthest-migrating animals on Earth. Northern Hemisphere Humpbacks travel from Alaska and British Columbia to Mexico, Hawaii and Central America, for the months of December to March. Southern, Antarctic-based Humpback Whales spend their winter months near Australia and as far north as Costa Rica from June to November. They are most likely to be seen in Costa Rica between August and October. 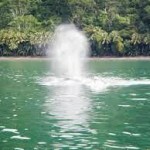 The southern whales are more common to see in Golfo Dulce, according to research by the CEIC. Females swim into the shallow waters of the Gulf's interior to birth their young and breastfeed them. Males concentrate in the outer area of the Gulf waiting to breed with available females. 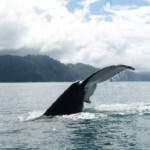 The CEIC and other environmental organizations, including Earthwatch, are working to create a Marine Protected Area within Golfo Dulce to safeguard the whales' reproductive and feeding grounds, and to establish buffer areas surrounding these critical habitats. "(There is an) urgent need to create connectivity between different marine protected areas to maximize the effectiveness in the protection of species and resources," note CEIC researchers. Humpback whales are an endangered species with international government-protected status. They are easy to see since they live at the ocean's surface. They swim slowly and are known as the "acrobats of the sea" for their aerial frolicking. 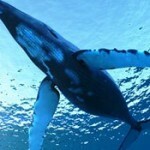 Humpbacks also are known for their "songs" - long, varied, and complex sequences of squeaks, grunts and other sounds. Only males have been recorded singing and they seem to produce the complex songs only in warm waters - thought by scientists, therefore, to be mating calls. 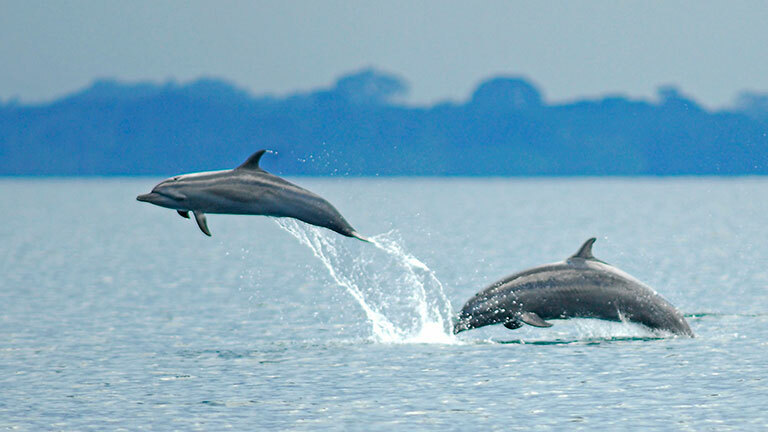 Golfo Dulce also is home to important resident and migratory communities of Bottlenose Dolphins, Spotted Dolphins, Spinner Dolphins, and the occasionally seen False Killer Whales. Visit Golfo Dulce. 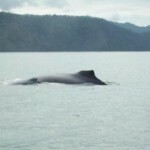 Stay on Golfo Dulce at Playa Nicuesa Rainforest Lodge, and see Humpback Whales and dolphins in person. The award-winning eco-lodge offers whale-watching boat tours of the Gulf to see marine life such as dolphins, sea turtles and whales. Playa Nicuesa Rainforest Lodge is located on a 165-acre private preserve bordering the Piedras Blancas National Park. A TripAdvisor Certificate of Excellence winner, the sustainable lodge is a unique adventure travel destination for its remote, pristine wilderness location.